On January 20th, in the USA, a flag was raised. 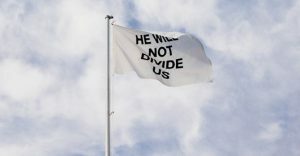 On the inaugural day of a new, controversial era for the country, artists LaBeouf, Rönkkö & Turner raised a flag stating “HE WILL NOT DIVIDE US”. The flag was livestreamed on the internet, and people could use a camera to give their own responses to the piece. Now to me, the statement “HE WILL NOT DIVIDE US” should be applauded. These artists are anti-Trump but whatever side of the political debate you’re on, coming together to discuss problems in a rational, maybe even friendly manner should be possible. Unfortunately, the last year has shown that this is increasingly difficult. The people shouting loudest (on all sides) seem to pretend there is no possible middle ground, areas for agreement, or justification for views which oppose their own. So instead of being a symbol of what America/ “The Free World” should be, HE WILL NOT DIVIDE.US became a target for right-wing hate. (Remember reading that Shia LaBeouf punched a Nazi? That was to do with this). After being moved to 3 separate US locations, the project was last week moved to our very own FACT, for security and support. But it’s already been taken down. Within a day people were on the roof to try to vandalise it, which was obviously considered a little dangerous. So it’s gone and its future is, once again, uncertain. I don’t blame FACT, or indeed any of the galleries involved, for making the decisions that they did. Reading about some of the violence which surrounded this piece in each of its USA homes, and the potential danger not only to the would-be saboteurs but the general public, I understand FACT’s decision. I’m delighted that FACT were willing to take a stand for supporting artistic freedom in the first place – and given the themes of “How Much of This is Fiction“, this whole story is uncannily relevant. I’m saddened that this is the place we’re in in the world right now, though. Let’s be honest – the Liverpool saboteurs are unlikely to be American Republicans. Apparently 4chan were advocating how to take it down – which tells me a lot about who is behind this. These are people who want to divide. They want to close down what they see as symbol of opposition, want their opponents to get riled and irrational. The turn towards censorship is worrying. This isn’t the only controversy of its type being talked about on my art-oriented Twitter feed – there’s a storm around race in the USA, and in an increasingly unstable and despotic Turkey, an artist sentenced to prison for her work. I’m a very traditional advocate for free speech – if you have a view on something, you should be allowed to express it. I might not agree with you, I may passionately argue against it. But we all have the right to opinions. Art is a completely reasonable, often powerful, way of airing them. But I also see this attack as a kind of weakness – whoever did this doesn’t have a clear mission statement to project themselves. Instead of creating their own symbols, all they can do is destroy those they don’t like. There’s no rallying cry to a cause, just hatred. And hate can be overcome. It can be difficult to stay ‘above’ shouting and attrition, when there are people out there trying to destroy expression and stir up hate. But as our world seems to be moving ever further towards the right, we must. We must still hold out for rational debate, and the potential for reason and reconciliation. 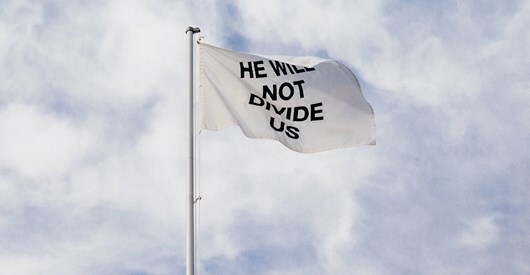 Whether HE WILL NOT DIVIDE.US will find another home remains to be seen. I hope it does. And I hope that FACT and other galleries continue to be a home to views from all sides of the spectrum. Flag image taken from here. This entry was posted in Home, Let's Talk About It and tagged art, flag, Liverpool, opposition, Politics, Trump. Bookmark the permalink.